Heather is our only out-of-state, animal care volunteer — and in more than a year of volunteering with us, she has NEVER missed hours! She and her family would pack up and drive here, nine hours each way so that she could follow her passion. We are so grateful that she found her way here and can now call herself a Pittsboro resident! Her dedication is unquestioned and her love for the animals shines through in everything she does. 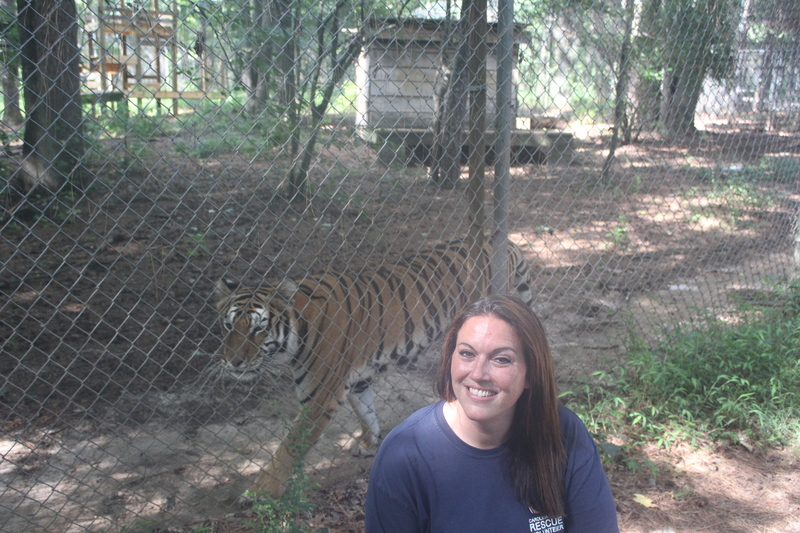 Heather smiles in front of Tasha Tiger. 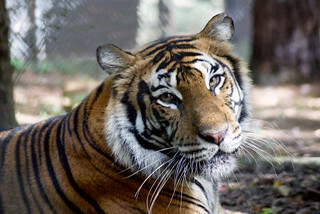 Time at Carolina Tiger Rescue: Heather began volunteering in August 2017 and has contributed 200 hours of her time since then. Favorite Memory: “I remember one of my first mornings volunteering. I was walking from the house to prepare to start waters and the lions began to roar. I stopped and just listened for a minute. It made me smile and warmed my heart. I thought, “what a beautiful sound and how cool is my job!” I’m truly blessed. There’s no other sound I would want to wake up to. My other memory is dear to my heart because it was with Toby, the bobcat. I sure do miss that boy! Left side waters will never be the same. He had a little game when filling his water bowls and it took me awhile to catch on. When I did , he made me laugh and brightened my morning. He made it quite clear that he loved to play hide and seek. I would slowly and quietly open the outside gate and walk in. Trying to be as quiet as I could so I could watch his reaction. He would quickly make his way back behind his box thinking I didn’t see him. As I would squat down to empty his water bowl he would peek behind the box. I would just laugh and say “Where’s Toby!” All the sudden he would jump from behind the box, look at me, and then he was done with his game. Usually walking away making his low grumbled growls as he always did. I sure do miss him and will always cherish the memories I have. He was such a handsome guy!